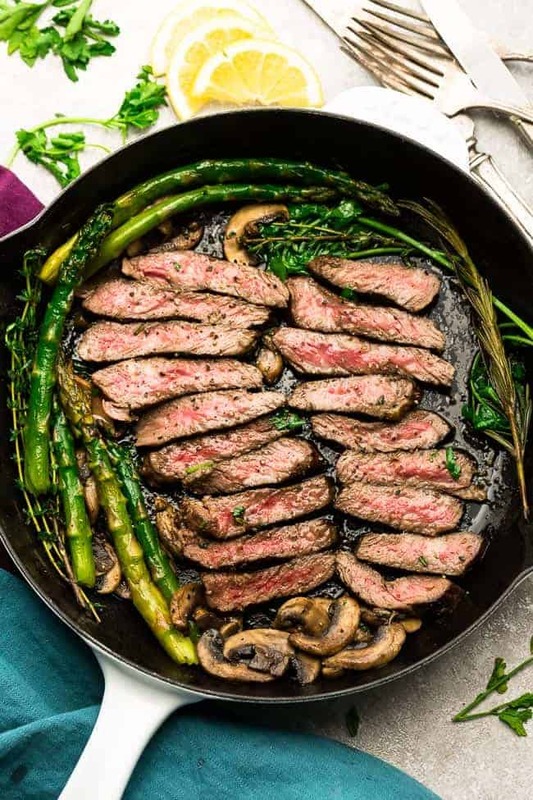 Pan Seared Steak with Garlic, Herb Butter, Asparagus and Mushrooms – easy skillet recipe plus”how to” tips to cook the best tender steak at home. This easy to customize recipe is also gluten free, low carb, paleo and keto friendly. When it comes to enjoying a nice steak dinner, do you prefer going out to a fancy restaurant – or saving a little bit of money and making it at home? 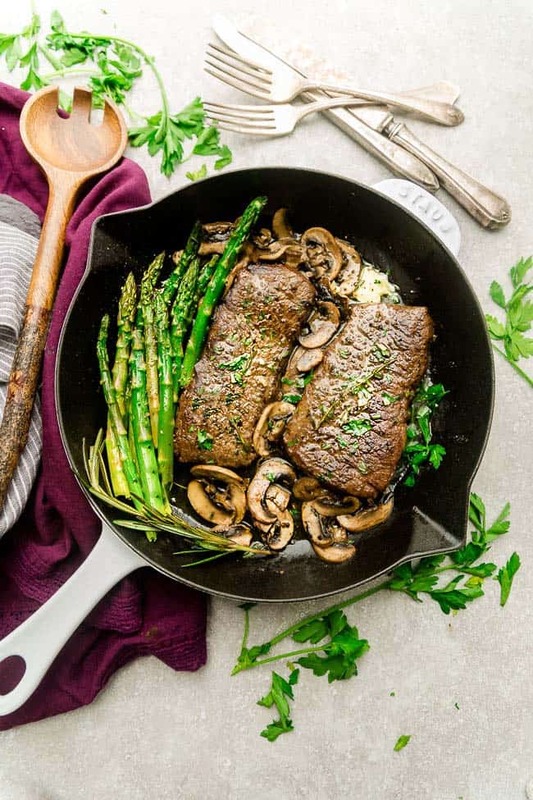 As much as we look forward to a nice dinner date night out, cooking the perfect pan-seared steak in the comfort of your own home is actually really easy. And if you’re looking for the Perfect Grilled Steak – be sure to head over HERE for tips and the recipe. 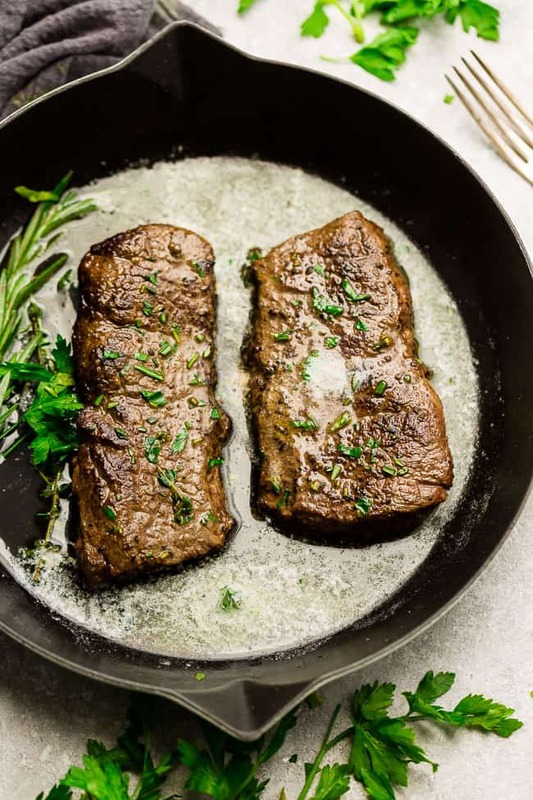 This Pan Seared Steak with Garlic, Herb Butter cooks up tender, juicy, full of flavor with a perfect and beautifully charred crust. Serve as a complete meal with a side of asparagus and mushrooms or swap in your favorite vegetables or side salad instead. 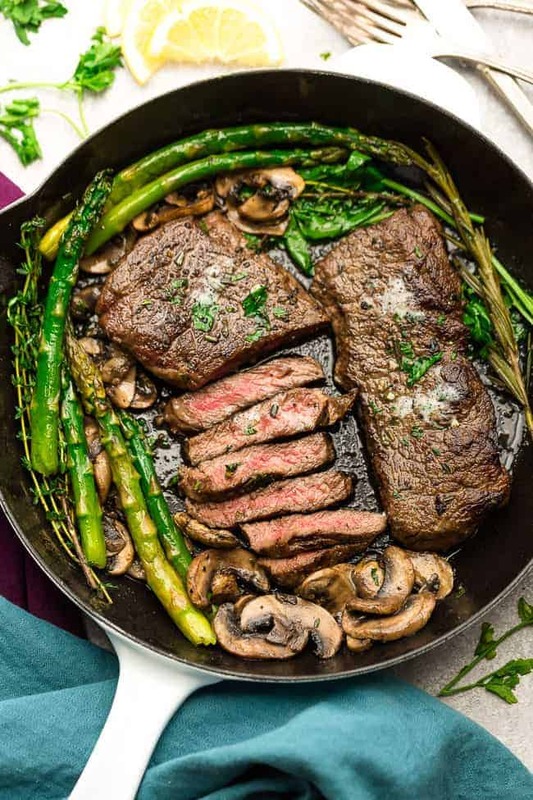 How amazing would this skillet steak dinner be for Father’s Day, a special date night in, or really any time you’re craving a succulent Rib-eye or T-bone steak? And if you’re looking for a heartier meat and potatoes meal, you can easily add some chopped Russet potatoes or baby potatoes to the mix. HOW TO CHOOSE THE BEST CUTS OF STEAK? For a perfect pan-seared steak, it’s important to go for well-marbled cuts —that extra fat enhances flavor and promotes tenderness. You can pick these cuts up at your local butcher or grocery store and be sure to ask for cuts that are one-and-a-half to two inches (1 1/2 – 2 inches) thick to ensure that your steak will reach the perfect char and maximum juiciness. Pat your steak dry with a paper towel and allow your steak to come to room temperature for even cooking. High heat will get a good sear along with a crispy and charred crust. I prefer using a cast iron for searing steaks because it’s naturally, nonstick, it retains heat wonderfully, and the material gives a better sear than a stainless steel pan. 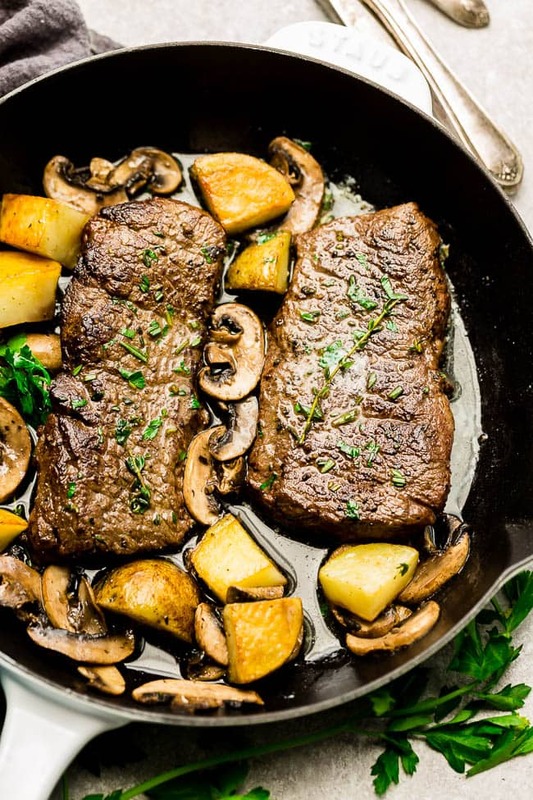 I highly recommend using a cast iron skillet to get the ultimate results and best flavor but if you don’t have one, you can use a high-quality stainless steel or copper core skillet instead. 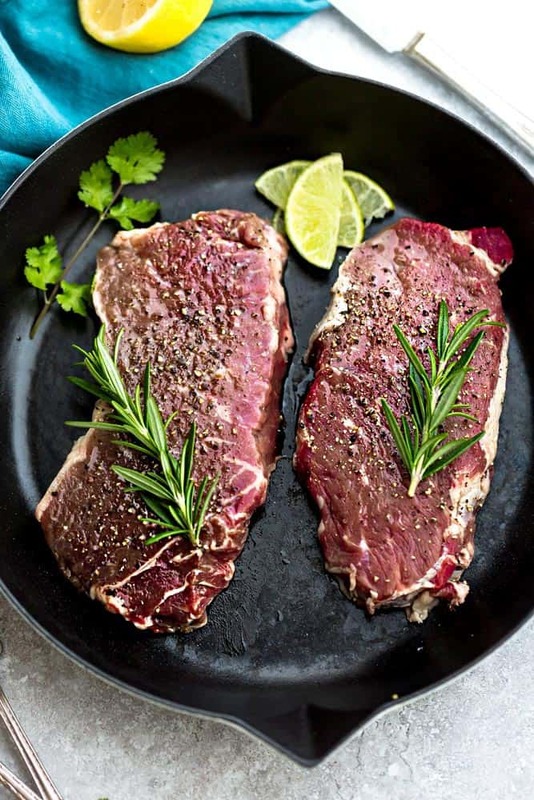 For budget friendly-steaks like flank, sirloin or a filet mignon, it’s also a good idea to add the best marinade you can along with any additional spices to you liking – minced garlic, minced onion, chili flakes etc. 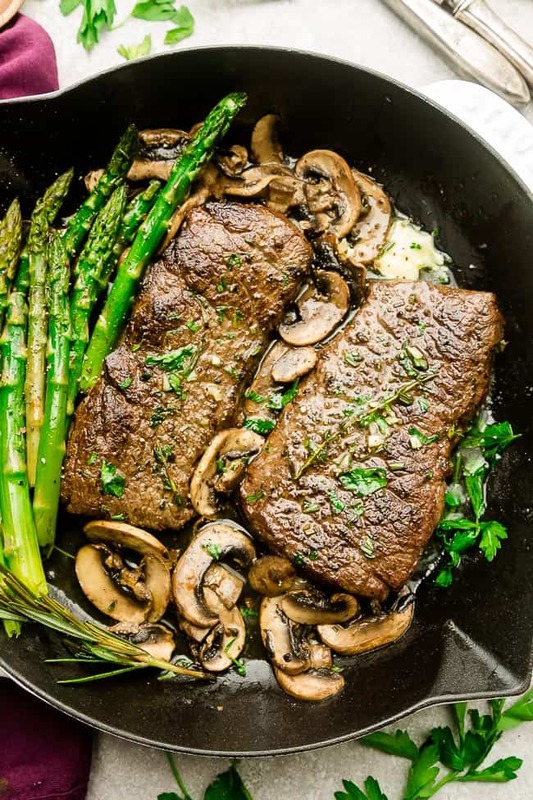 Roasted asparagus, sauteed mushrooms, mashed or crispy potatoes would be a great addition to your steak. CAN I HAVE STEAK IF I’M ON A PALEO OR KETO DIET? Yes, absolutely. Steak is so versatile and also fits if you are following a Whole 30, Paleo, low carb or a ketogenic diet. You can keep the seasoning as simple as you like and leave out the butter or use ghee for a Whole 30 dairy-free version. 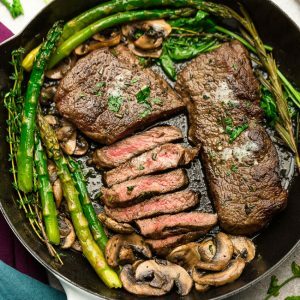 Pan Seared Steak with Garlic, Herb Butter, Asparagus and Mushrooms - pan seared in a skillet plus "how to" tips to cook the best tender steak at home. This easy to customize recipe is also gluten free, low carb, paleo and keto friendly. Pat steaks dry with a paper towel. Heat a cast iron skillet over high heat for several minutes, until the pan begins to smoke. Add 1 tablespoon of oil to the pan and brush on the remaining oil on the steak. Generously season the steak with salt and pepper. Once the steaks are almost done, reduce heat to low. Add butter, garlic, and herbs to the pan. Use an oven mitt or dish towel, grasp the than pan handle and tilt and swirl the pan to allow butter to melt. Use a spoon to drizzle and baste steaks until juicy on both sides (flip after 30 seconds) for about a minute. Transfer the steaks to a cutting board or platter, tent loosely with foil and let rest 5 minutes before slicing. Serve with roasted asparagus and sauteed mushrooms (if desired) along with any remaining sauce.